Mod The Sims - Nursery Add-Ons: Spruce up your BG and FT nurseries. 10-12-2011 Updated the changing table in the BASEGAME download files to be, well, base game compatible. The AL nanny fix was causing the game to freeze so if you experienced that issue please re-download the base game files and replace them with the new, or allow the new files to overwrite the old ones--which ever is easier for you. I'm sorry for the inconvenience. Thanks for the heads up, 15pupmaus49. Much appreciated. 10-12-2011 Updated the changing table in the EVERYTHING download files to be Seasons compatible. 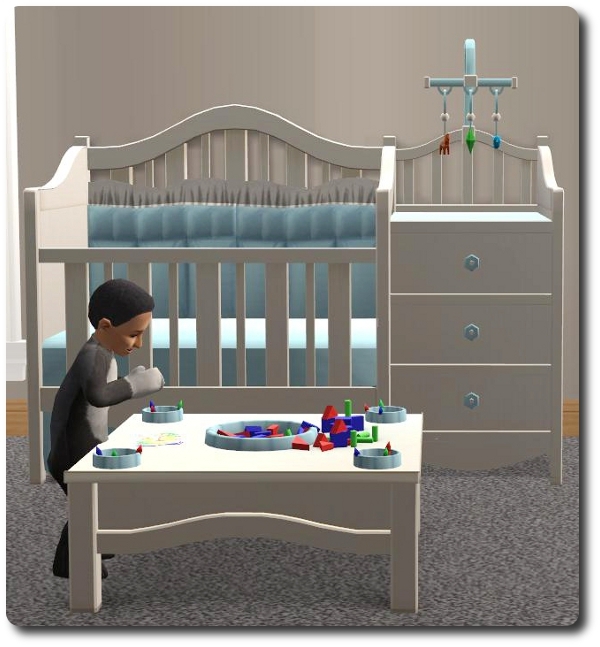 If you have Seasons and you want the outerwear options to be available on the changing table please re-download the EVERYTHING files and replace them with the new, or allow the new files to overwrite the old ones. 10-12-2011 Provided an additional changing table to support those with the Seasons expansion pack but not Apartment Life. 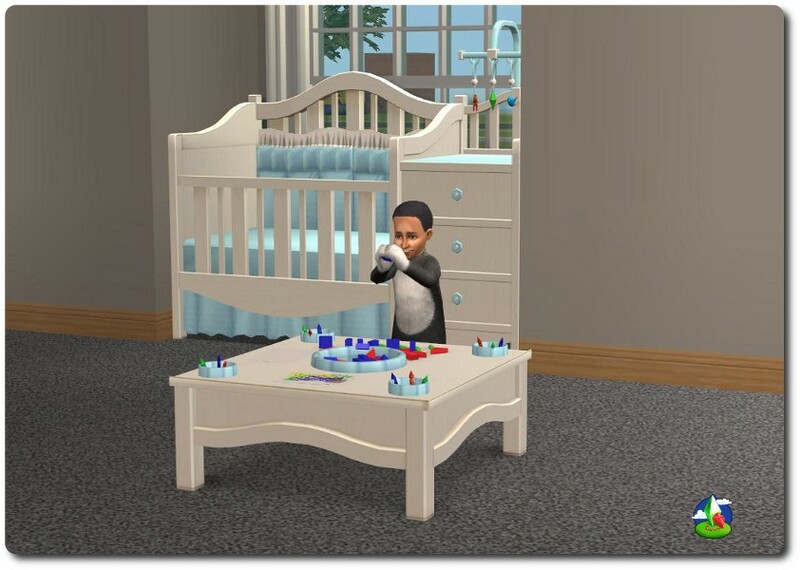 If you have Seasons and want to have the option to plan or dress your toddlers in outerwear you need to download the SEASONS file and allow it to overwrite the changing table that comes in the BASEGAME files. 10-12-2011 Animation fixes added for those without the Oh Baby! store items. If you're experiencing a problem with your sims putting the baby on the ground instead of in the baby dangle or the bouncy chair you need these files. 10-13-2011 Updated The Baby Dangle to allow it to be placed everywhere, like the crib or couch, without cheats (moveobjects on) instead of just on the changing table. 09-26-2012 Looking for recolors? Spacedoll recolored these in pooklets colors at GoS and Siofra did them in iCad's & Piggi's Holiday colors on their Dreamwidth. If anyone else has recolored these or knows of someone who has let me know and I'll be sure to include yours as well. 10-19-2012 Nursery Add-Ons II: A rocking chair and Haffa Crib recolors. 11-02-2013 Honeywell Nursery in Anna Colors by Keoni-Chan. 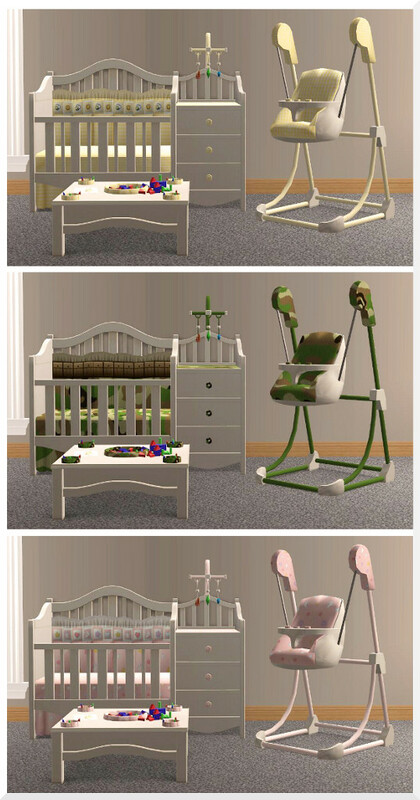 There are tons of really amazing nurseries for the Sims 2 already but when I saw these beautiful crib and changing table combos I thought I could find room in my game for a few more pieces. Especially if those pieces can be mixed and matched with the existing Base Game or Free Time nurseries to create a variety of new looks for a small amount of additional resources. With its space saving design and timeless style the Haffa Crib is a beautiful addition to any nursery. For the complete look don't forget "The Other Haffa" Changing Table. Modified Maxis meshes and textures. Slaved to The Kinder Kontainer. 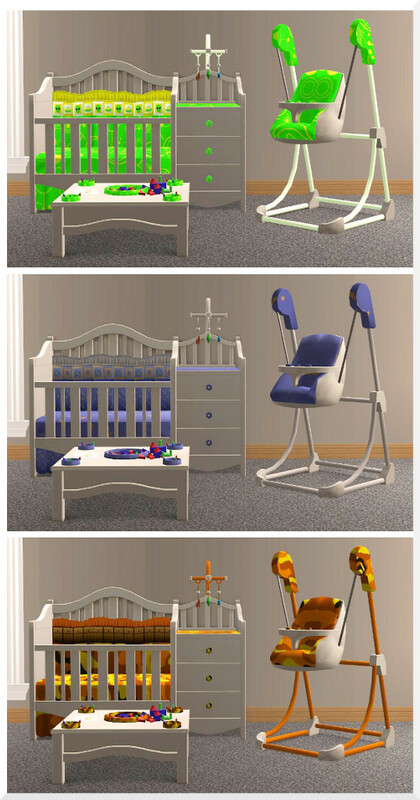 Master to "The Other Haffa" Changing Table, The Baby Dangle, The Bouncinator 3500 and the Four Corners Activity Table. Slaved to the Haffa Crib and The Kinder Kontainer bedding. A fun, interactive toy for baby that clips onto "The Other Haffa" Changing Table. WARNING: Baby Dangle is not safe for balconies. Slaved to the Haffa Crib and The Kinder Kontainer. Height Adjustable - It's positioned to fit the changing table but the height is adjustable so you can move it anywhere that's routable (a crib, couch etc.) and it'll still work. Basically, it functions as a cute, comfy place to store baby where they can play with their toys and nap so you don't feel like a neglectful sim parent. 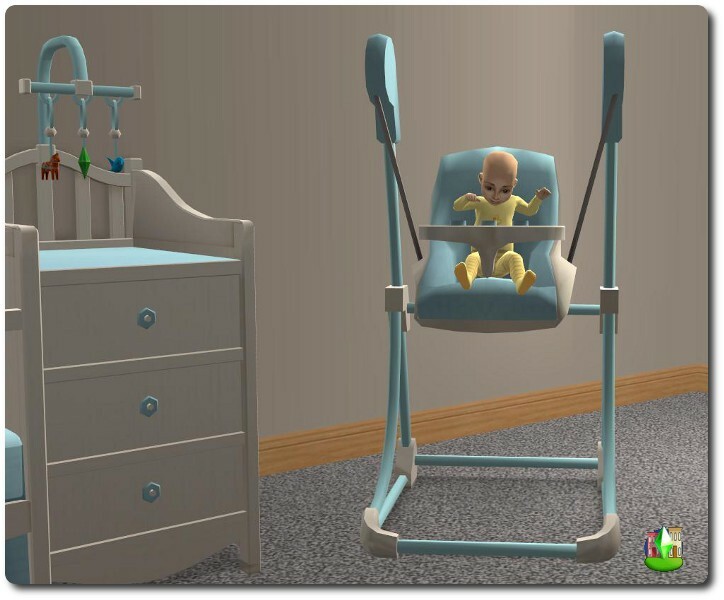 If you really are a neglectful sim parent, or maybe just a fertile one, you can stack babies to the ceiling or squeeze a bunch into one crib using moveobjects on. Keep baby entertained for hours with The Bouncinator 3500! You won't hear a peep out of them. Maxis mesh and modified textures. Sound fix provided by Havelock @MATY. Slaved to Haffa Crib and The Kinder Container. Sharp corners are our specialty! Slaved to The Kinder Kontainer and Haffa Crib. Table top mesh modified from the Mere Folly nursery set by Kate @parsimonious. There are small (I think small) animation issues with almost all of the set; the most noticeable having to do with the changing table and The Baby Dangle. 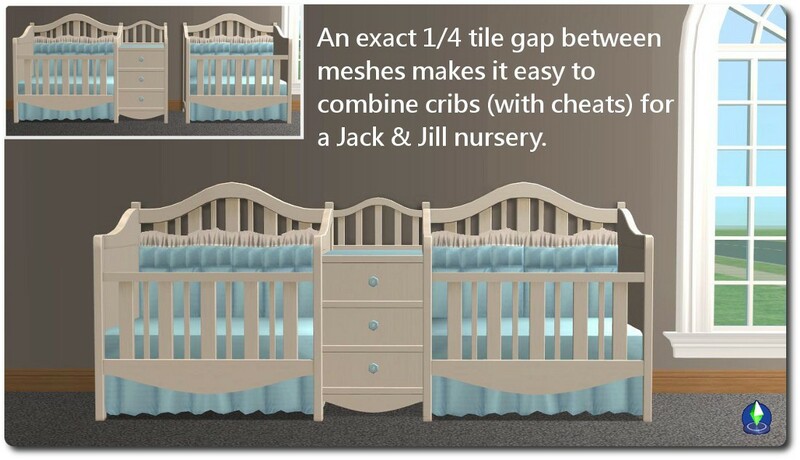 Babies and toddlers are slotted above the surface of the changing table in order to stop their heads from clipping and depending on the camera angle it's more or less noticeable. 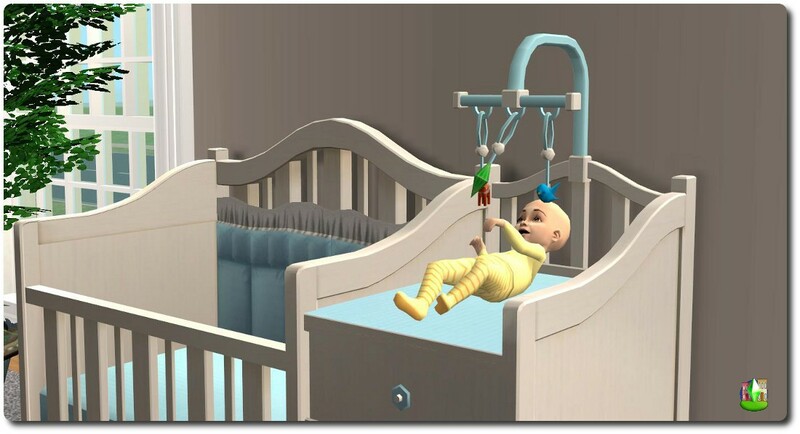 Sims also fumble around with the baby putting them in and taking them out of The Baby Dangle but it's far less noticeable in normal game play than the original animations (sims bent over to pick the baby up off of the ground). I tried my best to adjust the meshes, align the slots and switch out animations in order to get the best results but these are far from perfect. Even though I'm really happy with how these turned out I know everyone's tolerance for imperfections in their custom content is different so I uploaded a short video on YouTube so you can get a better idea of how these animate before you download--I'd hate for anyone to be disappointed. All of the pieces in this set have two separate, designable subsets. The bedding is slaved to The Kinder Kontainer base game crib and the wood is slaved to the Haffa Crib. 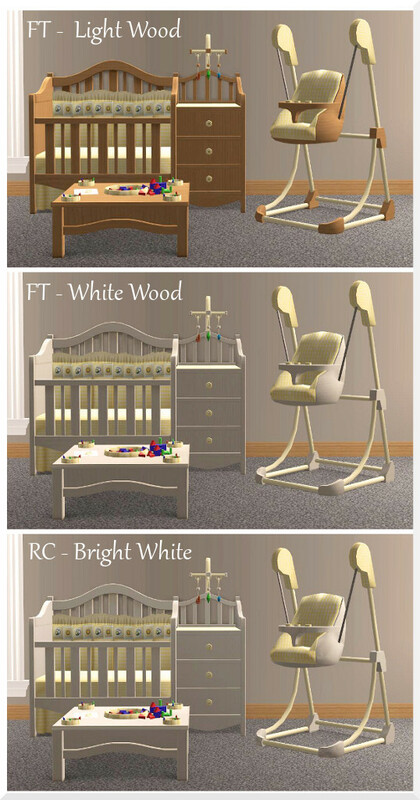 I originally planned to slave all of the wood to the Free Time Good Times changing table but because that set only has one subset, numerous duplicate wood recolors showed in the catalog for mine so decided not to. As a result, you can use the exact same texture that's used for the Good Times changing table to recolor the Haffa Crib and vice versa. In addition to the Free Time wood colors that the crib mesh comes in I've included a bright white recolor with a glossy finish. You can't really see that much of a difference in the pictures but it's a much better match for the base game pieces (and most of the CC nursery pieces I have) which don't have as much shading and texture. None in particular this time but if you haven't been, Inge Jones has some really wonderful mods for babies at simlogical under the Sims 2 Child Care section. As always, you're free to use anything of mine however you'd like including for your own projects. The polys are a little high for the 800 polys per tile rule of thumb but they're well in line with the equivilant EA meshes--over 2,000 polys less actually--which is about right since there's 2 fewer tiles. So while these aren't low poly meshes they shouldn't tax anyones computer that can run the game. SimPE, Wings3D, Milkshape (& plugins), GIMP, and MTS of course. A little over a year ago all I knew how to create were walls in Homecrafter so a huge thanks to all of the staff and creators at MTS who have been so generous with their time, knowledge and encouragement. HW_nursery-add-ons_EVERYTHING.zip | Description: If you have Free Time and Apartment Life and want everything shown this file has it all. Animation fixes may be needed. 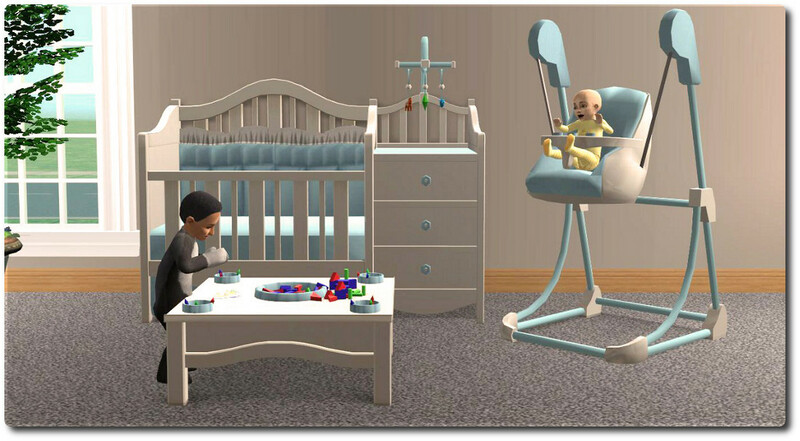 HW_crib_changingtable_BASEGAME.zip | Description: This file includes everything that&#039;s compatible with the base game: crib, changing table and recolor. HW_activitytable_FREE-TIME.zip | Description: This file contains the activity table which requires Free Time. HW_babydangle_bouncychair_APARTMENT-LIFE.zip | Description: This file constains the baby dangle toy and bouncy chair which require Apartment Life. Animation fixes may be needed. HW_nursery_ANIMATIONS-FIX.zip | Description: If you don&#039;t have the Oh Baby! store items you&#039;ll need these files for The Baby Dangle and The Bouncinator 3500 to work properly. HW_changingtable_SEASONS.zip | Description: If you have Seasons but not Apartment Life, download this file if you want the outerwear options to appear.